From your comments, it seems there are a lot of you out there who like the same things I like! No doubt there were many other wonderful things at market, but I only had limited time to peruse the market floor and so I had to pick my favorite stops. Luckily for me, my friend Lisa Bongean's booth (Primitive Gatherings) was one aisle over. Needless to say... I made frequent stops there. She has some irresistable new stuff coming out. I fell madly in love with the small quilts in the photo above. 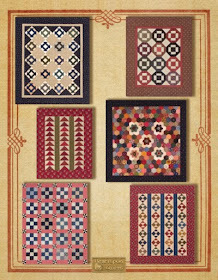 They are all new charm quilt patterns that will be released very soon. Notice they are all made with small blocks! That got me hook, line, and sinker. Lisa sells her own assortment of charm squares, too. 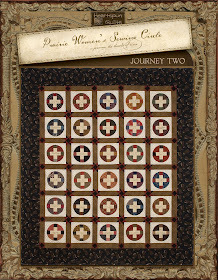 The two versions of the Broken Dishes quilts (light and dark) will also be new charm patterns. The wonderful wool applique projects featured in the photo above were from a new (to me) designer, Lily Anna Stitches. Lisa had her patterns and the kits for them as well!! 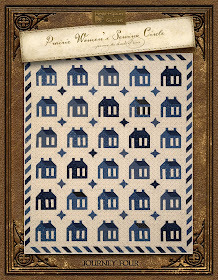 Click on the Primitive Gatherings link above to go shopping!﻿ One of the best purchases I made at market was a fat quarter bundle of Lisa's new fabric collection for Moda called Little Gatherings. YUM! Click here if you'd like to see the collection for yourself. My next favorite finds are from two of my long-time favorite designers. Sheri Falls of This and That. Chances are, if you're like me, you have many of their patterns in your library! Each of them had wonderful new projects to offer...some calling my name, believe me! Cathy Cardiff of The Cottage at Cardiff Farms. Cathy's booth full of quilts and wool projects was a market favorite to be sure. Last but not least is a another new fabric line coming soon from my friend, Beth Fuller! 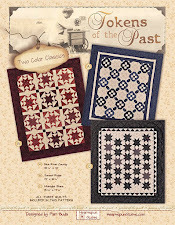 Her last collection, Grace's Dowry Shirtings, was very popular with quilters and has been reprinted several times. 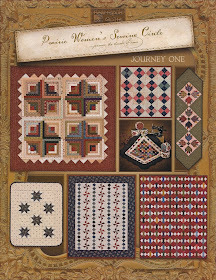 Her newest collection, Marguerite for Windham, is pictured in the quilt above. If you aren't familiar with Beth's work, take it from me....you will be! That brings us to the end of my Favorite Things from Spring Quilt Market. and be sure to ask for the wonderful projects highlighted in this post. Until next time, thanks so much for visiting with me today! I'm from Chicago and still live here in the 'burbs. In honor of our most famous resident, Oprah, I'll be sharing a few of my favorite things from Spring Market. Salt Lake City was very welcoming and fun. The mountains were still snow capped due to record snowfalls. Snowbird, UT still boasted 11 feet of snow while I was there, but warm temps were melting the snow too quickly causing flooding. All week the mountains were a beautiful backdrop and this prairie girl soaked them in the whole time I was there. Inside the convention center, there were loads of lovely things to look at as well! This lovely booth filled with wonderful eye candy was what my friend Karen and I got to look at all market long! Under the Garden Moon was across the aisle from us. It was such a pleasure to look at all week and we really had the chance to get to know owner/designer Amy McClellan. I instantly fell in love with the tiny Churn Dash quilts on the wall just behind Amy. I pined for it! The blocks are only 3 inches! You know how crazy I get over tiny blocks!! I tried to resist.....I caved on the last day! I had to buy the pattern. It's called Simply Dashing. I'll bet you see a few things you want too! 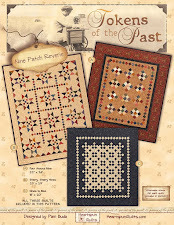 The new block of the month by Bonnie Blue is called Cotton Club and grabbed me from the first instant I saw it advertised on the web. There are many wonderful new BOM's out there, but this one is so different. If you like it in photos, wait until you see it up close and personal! I was signed up before I saw this quilt finished, and elated over it when I got to see it in their booth. OMG you guys! Don't miss out on making this quilt. It has gorgeous fabrics, and 5 inch blocks.....what's not to love??? I have been a fan of Carol Hopkins for as long as she's been in business. Don't we all love her Civil War Legacies patterns? 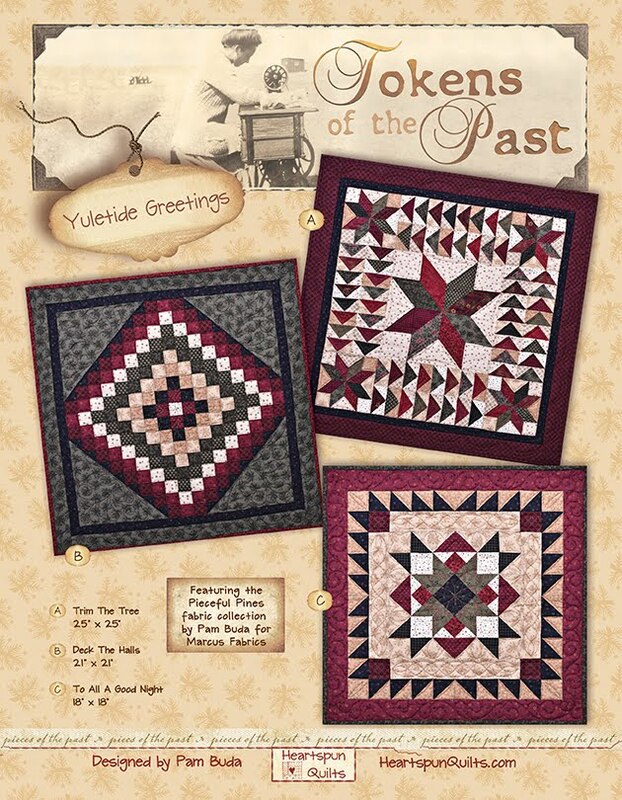 Carol released 8 new patterns at market and each one is more wonderful than the next. Visit her website to see them all. I can't wait to make Bonnet Ties, Caissons Rolling and Hard Crackers. Does anybody know where I can buy more time?? This luscious display shows the work of my pal, Evonne Cook, of Clothesline Quilts. Hanging just behind Evonne are her two latest additions to her General's series of Civil War quilts. As you can see, there's a whole lot to love in her booth too! ﻿Our tour ends today with my dear friend Lynne's booth. I could just live in the Kansas Troubles booth! When I was walking down the aisle approaching KTQ, I got tingles!! The awesome block of the month on the right is called Ten Years and Counting and is Lynne's celebration of ten years creating KTQ fabrics with Moda! Of course it's on my to-do list. I think I have enough KT fabric to make 25 of them! Hey! No snickers from the peanut gallery!! 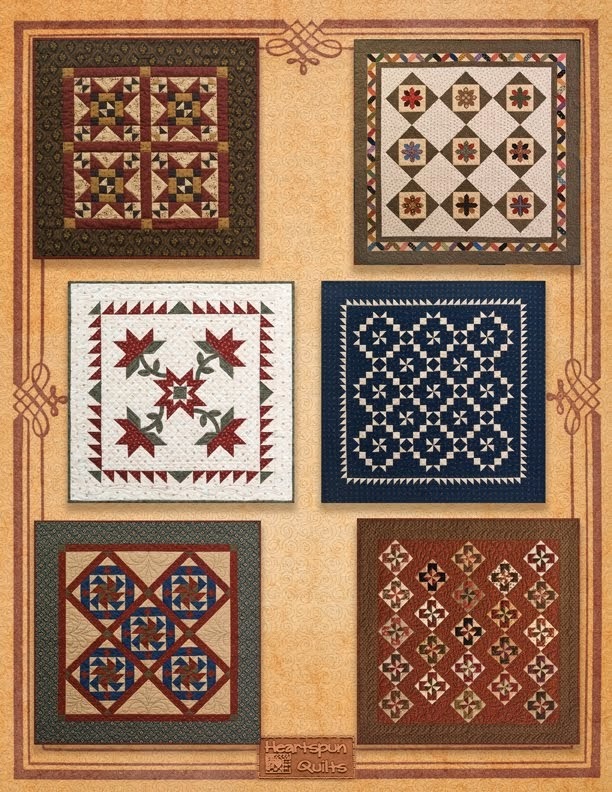 The little patterns hanging on the display and the quilts hanging to the right on the flower pot stand are all just released charm quilt patterns.....way too cute!! Look for these coming soon to your local quilt shop! 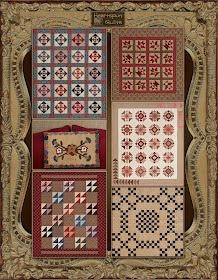 The other quilts in the photo are all new as well made from Lynne's newest line called Cattails and Clover. This fabric will be out in a few months and is full of the sweetest assortment of prints that are just what we expect from Kansas Troubles! 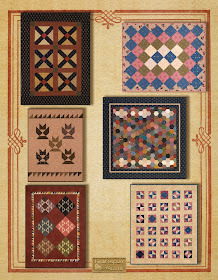 This collection of patterns are brand new and available right now. They feature Lynne's line called Warm Memories. Warm Memories is being delivered to quilt shops right now, so look for it...it's out there and you'll want some, belive me!! It is Lynne's "not really Christmas" line and is just wonderful. Brace yourself.....there are more than a few prints in that collection that I had to buy major yardage of. I have lots more to show you in my next post. I won't make you wait too long, I promise. are yours too? Thanks for visiting! In my last post, I told you about some new techno gadgets I bought that were supposed to make my life easier and make it possible for me to take photos and blog from anywhere at Quilt Market. HA! Obviously, since there was absolutely nothing new on my blog since then, I guess you can figure out who conquered whom!! I apologize for what seemed like falling off the face of the earth.... but believe me when I say it wasn't for lack of trying!! My iPad and iPhone didn't connect with the internet and work in harmony the entire time I was gone. I couldn't even access Facebook from my phone once I landed in Salt Lake City! This morning, I logged onto Facebook and it reported that my phone was in an alternate location and it locked me out for security reasons. Well....thanks alot! I had internet access at the hotel but then Blogger wouldn't cooperate. The iPad worked well at the convention center capturing images, but in the building, it was like a tin-can and I couldn't get a signal. Eventually, frustrated for us all, I gave up. I hoped you'd hang in there for me until I got home. With that hope in my heart, I scoured the market floor for good stuff to show you. My camera(s) and I did a better job with photos and gathering info, so I will commence with what I found new at market. Since I share the same city with Oprah, in the next few days, I will set out to show you my favorite finds from the Salt Lake City spring market, but for now, here is what my booth looked like. Salt Lake City or Bust! Very early tomorrow morning, I will be headed to the airport catching a plane for Salt Lake City to attend quilt market. 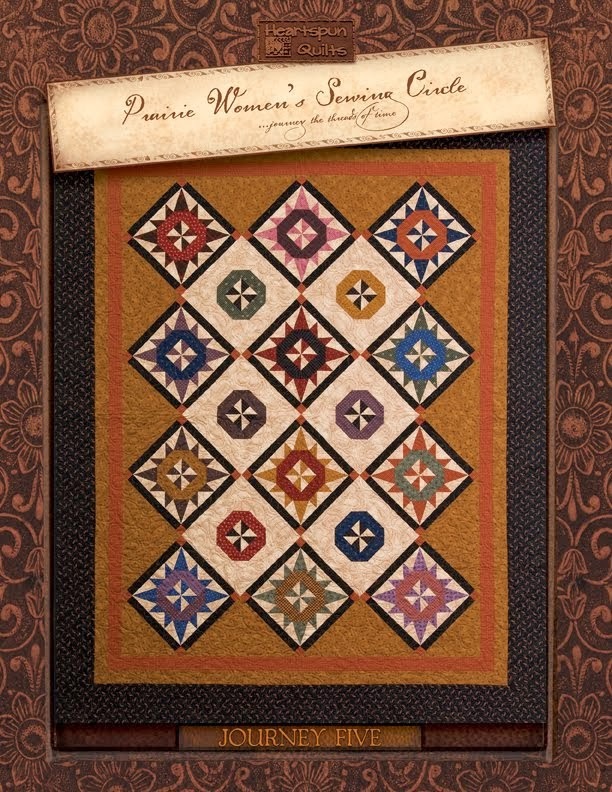 Everyone in the quilting and sewing world work hard creating new things, and attending at least one of the two markets held each year is an exciting way to unveil your new patterns, projects, and goodies of all kinds. On Tuesday, Wednesday and Thursday, we will all be arriving, setting up booths, giving and attending Schoolhouse presentations and shopping at the infamous Sample Spree. The show floor opens on Friday morning and closes on Sunday night. 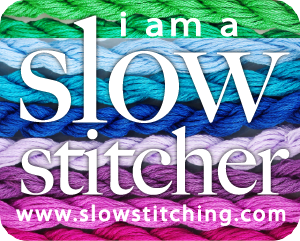 This will be my fourth market as an exhibitor, but is my first market as a blogger, where I can post lots of pictures and write about it all right here! I have a few new technological gadgets that are supposed to help me do just that. They are state of the art.....sadly, I am not. So, while I can't promise you'll have daily postings, I'm sure gonna try! I invite you to visit my blog and my Facebook page often. You'll either see market news, or evidence of how far I have to go with technology. For those of you who enjoy reading blogs, this will be a great week to blog hop as so many of us are attending and writing about the show. So have fun attending quilt market with us and I hope you'll enjoy all the new stuff that is sure to be coming soon to your local quilt shop! I hope you all enjoyed the blogs on the tour this past week. I know I had a lot of fun visiting all of the designers and I enjoyed how different and creative they all are. I was definitely inspired! I just loved reading all of your comments!! They were wonderful and entertaining. 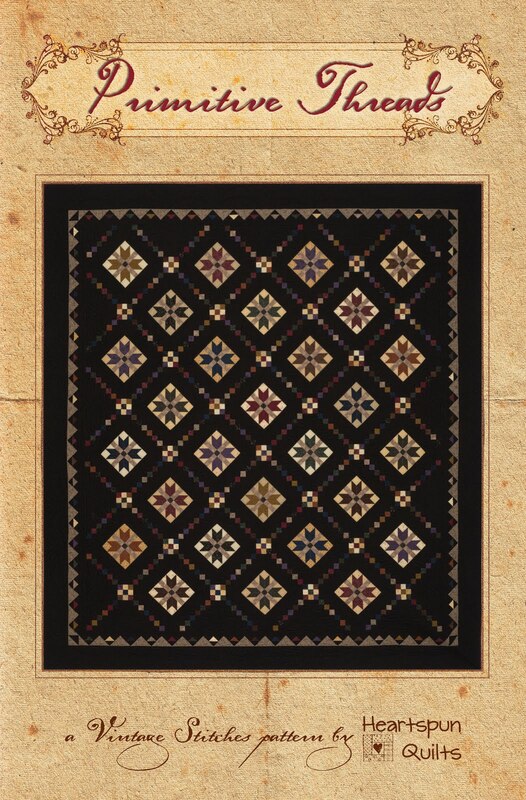 I really enjoyed reading about which fabric version you liked best for the block. The Kansas Troubles version was the overwhelming favorite. As you may know, I'm just a little fond of KT fabrics, too! the naming of quilts and blocks can sometimes be very fun, and sometimes not! Often they practically name themselves. Other times not so much, and if I have a deadline and still need to name the quilt, I secretly call it the "pain the dupa" or something like that, only not using those pretty words. Gasp! Good Time Charlie (block # 262 on page 56) may look harder to piece that it really is. 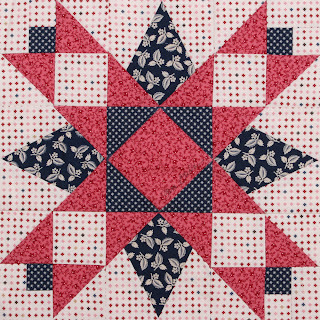 The four corner units are very simple to make and the angles of the Half Square Triangles will help to create a fun secondary design as you'll see in the quilt below. The center of the block is a simple square-in-a-square made with the wonderful and versatile connector corner. The center units with the larger blue print can be pieced with a template or you can use the Tri-Recs ruler (from EZ Quilting) as I did. Once the Tri-Recs unit is made, you just add two pink connector corners. That's it! I thought perhaps you would like to see what Good Time Charlie looks like in other fabrics. I thought you may also enjoy seeing what the blocks look like in a quilt. Good Time Charlie Quilt 65" x 65"
*From 3/4 yard of background fabric ~ Cut (2) 12 1/2" x WOF strips ~ subcut (40) 12 1/2" x 2" sashing strips. 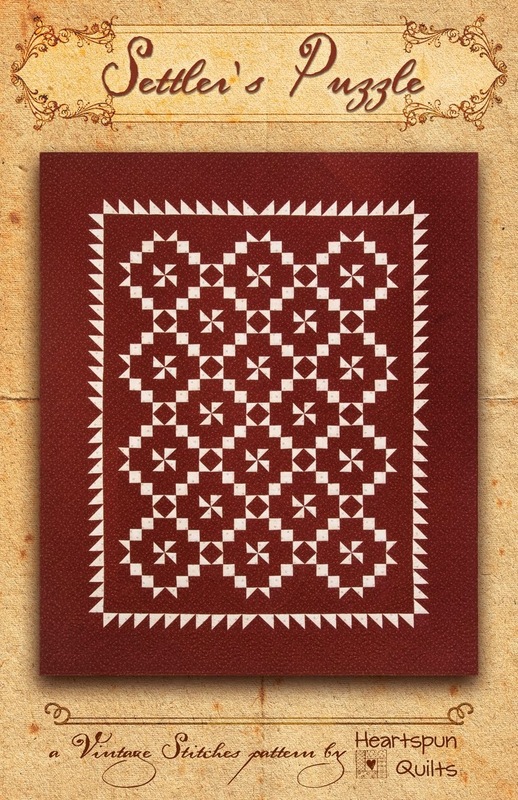 *From a Fat Eighth of red fabric ~ Cut (25) 2" x 2" squares for cornerposts. *From 1 1/4 yards of border print ~ Cut (7) 5 1/2" x WOF strips. The 100 Blocks magazine will be in your favorite quilt shop and on newstands every where by May 10th....so don't forget to pick up a copy or two! 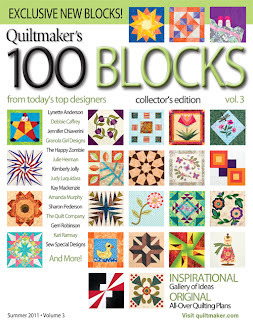 Remember, the Quiltmaker's 100 Blocks Blog Tour is going on all week! Quiltmaker's 100 Blocks magazine! Check back on Saturday to see if you've won!! Thank you for visiting today and good luck! 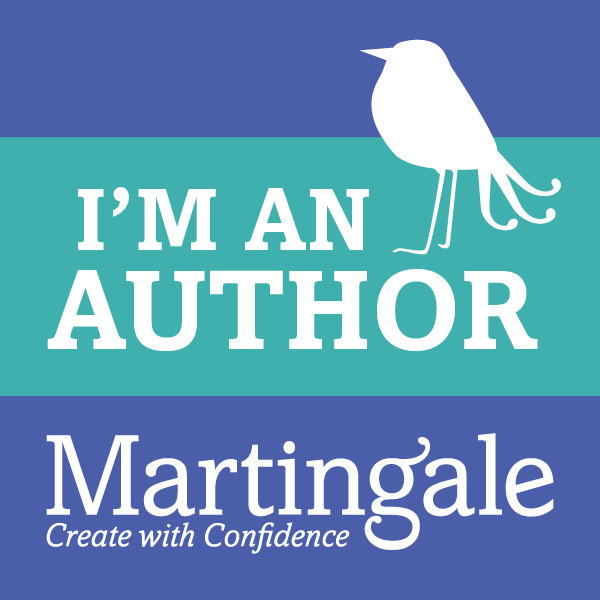 It's Almost Time for the Quiltmaker Blog Tour!! 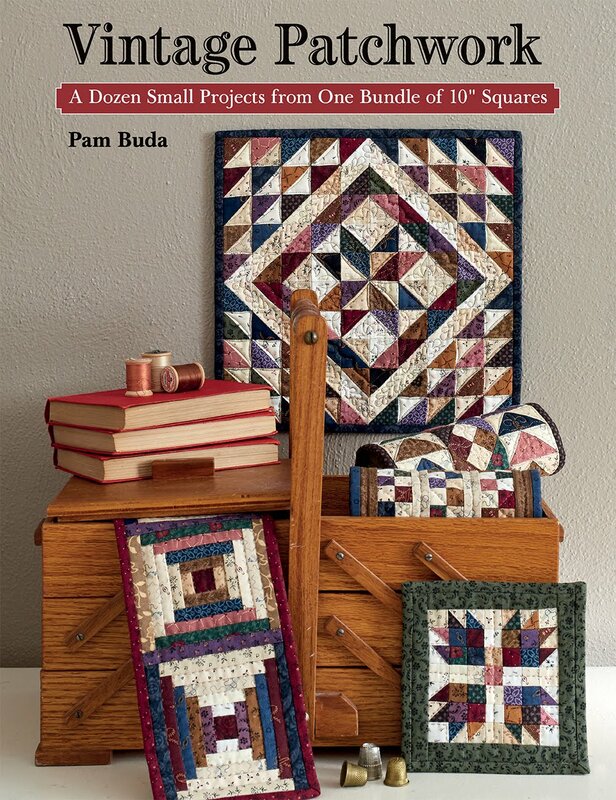 Just a reminder that the Quiltmaker's 100 Blocks From Today's Top Designers blog tour starts Monday, May 2nd and goes through Friday, May 6th. You won't want to miss this event!! There's a lot of inspiration to be had, prizes to win and best of all.....it's free! Return to my blog on Tuesday, May 3rd to see the block I designed and to win a copy of the magazine!! 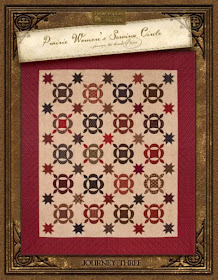 Go to www.Quiltmaker.com/100Blocks to participate in all of the festivities!! There will also be a lot of chatter on Facebook, so be sure to add Quiltmaker Magazine as a friend!